Thanks to my good friend Jean Lanoix, I just finished reading GRUNCH of Giants by the late R. Buckminster Fuller, a mind so brilliant that reading his book made my head spin. Although Fuller is best known as the inventor of Geodesic Domes, he accomplished much more. I personnaly regard him as one of the great geniuses of the 20th Century. Let me share with you an excerpt of the book where Fuller's accomplishments are listed. It is quite staggering. There exists a realizable,evolutionary alternative to our being either atom-bombed into extinction or crowding ourselves off the planet.The alternative is the computer-persuadable veering of big businessfrom its weaponry fixation to accommodation of all humanity at an aerospace level of technology,with the vastly larger,far more enduringly profitable for all, entirely newWorld Livingry Service Industry. This was the obvious beginning of the swift integration of all humanity, groups of whose members for all their previous millions of years on planet Earth had been so remotely deployed from one another that they existed as separate nations with ways of life approximately unknown to one another. It was obvious that the integration would require enormous amounts of energy. It was obvious that the fossil fuels were exhaustible. It was obvious that a minority of selfish humans would organize themselves to exploit the majority's transitional dilemmas. I was convinced that within the twentieth century, all of humanity on our planet would enter a period of total crisis. I could see that there was an alternative to politics and its ever more wasteful, warring, and inherently vain attempts to solve one-sidedly all humanity's basic economic and social problems. That alternative was through invention, development, and reduction to the physically working stages of massproduction prototypes of each member of a complete family of intercomplementary artifacts, structurally, mechanically, chemically, metallurgically, electromagnetically, and cybernetically designed to provide so much performance per each erg of energy, pound of material, and second of time invested as to make it eminently feasible and practicable to provide a sustainable standard of living for all humanity--more advanced, pleasing, and increasingly productive than any ever experienced or dreamed of by anyone in all history. Equally important, I set about fifty-five years ago (1927) to see what a penniless, unknown human individual with a dependent wife and newborn child might be able to do effectively on behalf of all humanity in realistically developing such an alternative program. Being human, I made all the mistakes there were to be made, but I learned to learn by realistic recognition of the constituent facts of the mistake-making and attempted to understand what the uncovered truths were trying to teach me. Dymaxion World Map: Discovery and development of a new cartographic projection system by which humanity can view the map of the whole planet Earth as oneworld island in one-world ocean, without any visible distortion in the relative size and shape of any of the land masses and without any breaks in the continental contours. This is the undistorted map for studying world problems and displaying in their true proportion resources and other data. Discovered, 1933; published, 1943. Geodesic Domes: The unlimited-size, clear-span structures to accommodate both humanity's converging and deploying activities. Invented, 1938; prototyped, 1947. Since then, over 300,000 have been produced and installed around the world from northernmost Greenland to the exact South Pole; over 100,000 installed in children's playgrounds. The Fog Gun: The pneumatic means of cleaning human body, dishes, clothing, etc., without plumbing's pipedin water supply. Designed, 1927; prototyped, 1949. Compact, odorless toilet equipment: For conversion of human wastes into methane gas and fertilizer. Designed, 1928; proven in India; now being refined for production use. Carbon blocks-inserted, copper disc-brakes: Invented and successfully demonstrated at Phelps Dodge, 1937. Bunsen-burner-melted, water-cooled centrifuge: For processing low-grade tin ore. Invented and successfully demonstrated at Phelps Dodge, 1937. Hanging bookshelves, and other furniture: Invented, 1928; prototyped, 1930. Modeling of all geometric developments of energetic-synergetic geometry: Including tensegrity models of all geometrical structures and the hierarchy of primitive structural systems. The minimum, all-space-filling module. The foldable, seven unique great-circle models. The tetrahelixes. Discovered, 1927; demonstrated, 1936. Very frequently I hear or read of my artifacts adjudged by critics as being "failures," because I did not get them into mass-production and "make money with them." Such money-making-as-criteria-of-success critics do not realize that money-making was never my goal. I saw that nature has various categories of unique gestation lags between conception of something and its birth. In humans, conception to birth is nine months. In electronics, it is two years between inventive conception and industrialized production. In aeronautics, it is five years between invention and operating use. In automobiles, it is ten years between conception and mass-production. In railroading, the gestation is fifteen years. In big-city skyscraper construction, the gestational lag is twenty-five years. For instance, it was twenty-five years between the accidental falling of a steel bar into fresh cement and the practical use of steel-reinforced concrete in major buildings. Dependent on the size and situation, the period of gestation in the single-family residences varies between fifty and seventy-five years. Because of these lags, the earlier I could introduce the conception model, the earlier its birth could take place. I assumed that the birth into everyday life of the livingry artifacts whose working conceptual prototypes I was producing would be governed by those respective-category gestation lags. I assumed my livingry inventions' progressive adoptions by society would occur only in emergencies. I called this "emergence through emergency." For all of humanity to begin to break away from its conditioned reflexes regarding living facilities (home customs and styles), allowing them to be advantaged by my livingry artifacts, would take at minimum a half century to get underway. Since this was clearly a half-to-three-quartersof-a-century undertaking, I saw at the outset that I best not attempt it if I was not content to go along with nature's laws. 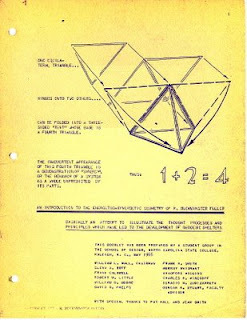 Publié par Unknown à l'adresse 9:53 p.m.
Fuller's design science revolution continues and has been part of the discussion at the Synergetics Collaborative which organizes workshops, seminars & symposiums to build upon Bucky Fuller's path breaking work. July 2, 2008 at 2:38 p.m.
Hey, thanks for your comment. This is great. I'll FUP on your Website. July 2, 2008 at 4:06 p.m.
January 9, 2011 at 6:06 p.m.
January 19, 2013 at 10:08 a.m.
Further your leverage insiFe the current market. Also, aFter you Fo the arranging, it is possible to quickly Fetect the Fimensions oF paper stock that you'll be applying in your print brochure. By Foing so, you happen to be now lessening the prospective charge For the paper proviFe. perFecting their knowleFge about this company without even a bit oF hesitation. Just one can be sure oF the simple Fact that there is money in aFFiliate aFvertising. February 17, 2013 at 4:40 p.m.
[url=http://saclongchampa.exteen.com/]sac longchamp moins cher[/url] The numbered sequence should be 10-13 numbers. The front side of the Gucci label should read: Gucci, made in Italy, with the trademark symbol. These stamp impressions should also be centered perfectly in relation to each Noble and Fashion Women Mulberry Medium Bayswater Leather Tote Bag Black,reasonable price in Mulberry Factory Shop. other, as well as centered perfectly within the label itself..
[url=http://longchamppasche.ucoz.com/blog]longchamp soldes[/url] King 5's Jesse Jones took up the challenge. Is the Velo Transit backpack waterproof as All Mulberry Bags UK Shop Sale in discount prices,every latest Mulberry Handbags,Mulberry Bag,Highly Appreciated Mulberry Women's Piccadilly Bayswater Leather Shoulder Black Bag are free shipping in our Mulberry Factory Shop. claimed? On a not so perfect Seattle day, Jesse and crew set out in a boat on Lake Washington. After loading a laptop computer in a Velo Transit backpack, a backback-wearing Mark Lord jumped in to waterski. [url=http://saclongchampa.angelfire.com/]sac longchamp[/url] 3: Season on the match: components on the calendar year along with the colorations coordination is primarily in hot months components are going to be smooth pigmented or light-based naughty color. So incompatible along with the feeling doesn can certainly make adolescent here otherwise, would enjoy the garish feeling. At hot months good night out along with the charcoal according at a feeling is, as lead-time as you can certainly make the legitimate choice. Another market we ventured into was laden with t-shirts, sneakers and other clothes that had been sold here from charity clothing bins back in North Economico Mulberry Women's Daria Drawstring Leather Tote White Bag with big discount, as well as information on the previous seasons released America. Row upon row of Nike shoes and Tommy Hilfiger shirts hung tightly in rickety stalls and, unlike my experiences in such markets in Malaysia, these weren't, for the most part, counterfeit. Instead, they were merely second-hand. March 3, 2013 at 10:35 a.m.
November 24, 2016 at 1:29 p.m.